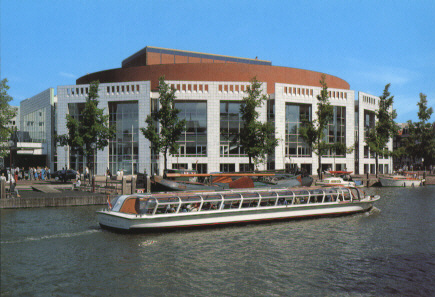 Built 1981-1986 by Wilhelm Holzbauer and Cees Dam (using designs by Bijvoet for the auditorium), as part of the "Stopera" complex (combined with the Amsterdam city hall, "Stadhuis"). Auditorium ceiling by Peter Struyken. Opened 23 Sep 1986 with the world premiere of Otto Ketting's "Ithaka". 1600 seats. 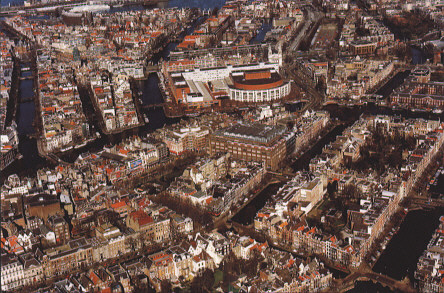 Home to "De Nederlandse Opera", "Het National Ballet", and "Holland Symfonia". 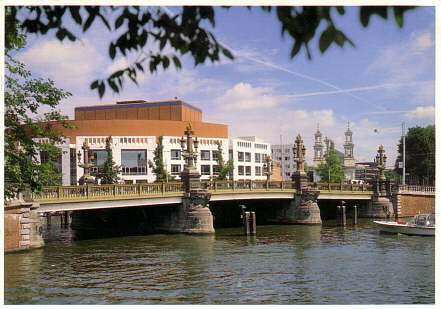 Used for opera and ballet performances by the resident companies, as well as for guest performances and concerts. Reverse Text: "Amsterdam / Holland, Stopera"
Reverse Text: "Amsterdam / Holland, Centrum"
Publisher: Amsterdam Canal Cruises b.v.